overall size of 20.25" x 24"
The Pyrocumulus Atomic cloud over Nagasaki reached over 60,000 feet. The blast had an equivalent yield equaling 20,000 tons of TNT. On August 9th, 1945 at 29,500 feet over the Urakami Valley, near the city of Nagasaki, the second act of atomic age unfolded. The primary target had been Kokura, Japan, but smoke and haze from the previous night's raid on the neighboring city of Yawata obscured the city and saved it from annihilation. 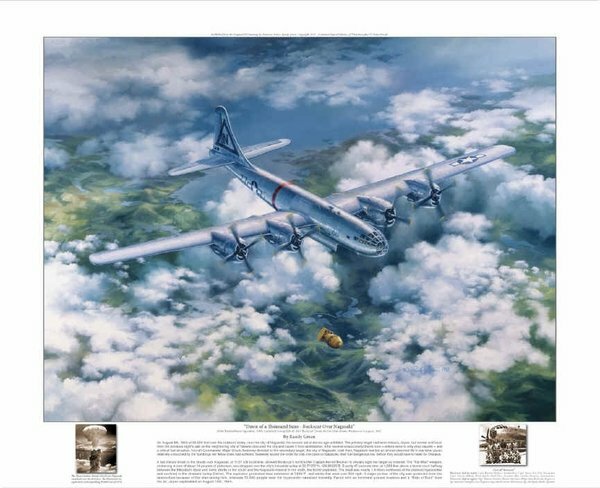 After several unsuccessful bomb runs – orders were to only drop visually – and a critical fuel situation, Aircraft Commander Major Chuck Sweeney diverted to the secondary target, the city of Nagasaki. Until then, Nagasaki had led an almost charmed life in war-time Japan, relatively untouched by the bombings her fellow cities had suffered. Sweeney issued the order for only one pass on Nagasaki, their fuel dangerous low, before they would have to head for Okinawa.